From self-driving moonshots and electric vehicles to hydrogen-powered experiments and 3D-printed cars, the North American Auto Show is currently showcasing a wide range of futuristic concepts which automakers claim will be on the road in just a few years. Whether or not that turns out to be true is a question for another day, but for now it’s easy to sit back, soak in the concept designs, and consider the possibility that America’s roads could soon be far more diverse than ever before. Here are some of the most intriguing and anticipated cars shown off in Detroit this week. Easily one of the most interesting vehicles displayed was General Motors' all-electric Chevrolet Bolt. The car is being touted as a “Tesla killer,” with a single-charge range of more than 200 miles and an affordable price point of $30,000. The car is currently built with lightweight materials such as aluminum, magnesium, and carbon fiber. It can also self-park and allows drivers to use their smartphone as a key. There’s no specific launch date set in stone for the Bolt just yet, but GM is positioning it for a 2017 release. The most futuristic looking car in Detroit in terms of aesthetics, the super aerodynamic Mercedes F015 Luxury sedan is the kind of vehicle people imagine when they think of science fiction. It’s not just the look that makes the F015 noteworthy, though, since it features autonomous driving capabilities to the point that Mercedes doesn’t even want to limit its description of the vehicle to a “car.” The company imagines the F015 as a “private retreat,” complete with wooden floors and swiveling chairs that can face each other in order to create a lounge-type atmosphere. Mercedes also stated that the self-driving car could be outfitted with either an electric motor or a fuel cell. Going forward, 3D printing is going to be huge, but this year’s auto show also gave us a glimpse at how the technology could affect drivers everywhere. Local Motors showed off the world’s first 3D-printed car by building it on the show floor in Detroit. The Strati is built out of carbon fiber-infused plastic and can be manufactured by a 3D printer in just 44 hours. Other parts – like tires, the electric battery, motor, and suspension – need to be attached after the car’s panel and frame are printed, but Local Motors is hoping to get the whole manufacturing process down to 24 hours. Lots of tests still need to be carried out on the Strati, but Local Motors is hoping to start selling its first set of cars later this year, in a price range of $18,000 to $30,000. 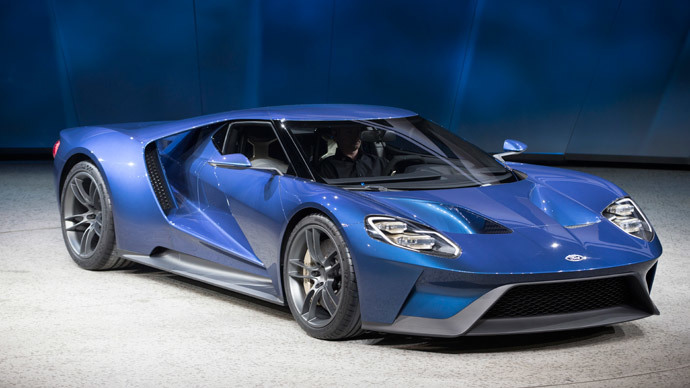 Ford delighted racecar enthusiasts everywhere by reimagining the legendary Ford GT in a gorgeous Liquid Blue color. The car features a 3.5-liter EcoBoost engine with more than 600-horsepower, and is set to go into production next year. More importantly for racing fans, there are plans to race the Ford GT this year, though mum's the word on whether it will compete at Le Mans -- where the original Ford GT40 shocked the world decades ago by defeating Ferarri and taking the top three spots. Although essentially unknown in the United States, Chinese company GAC Group is hoping to have a North American presence by 2017. At this year’s auto show, the company revealed its GS4 compact SUV, saying one of its dreams is to enter the North American market. The lone Chinese company to showcase in Detroit, GAC touted its compact SUV as a milestone car which shows that Chinese automakers can meet international standards and deliver a quality product. While GM touted a new electric car and Nissan also announced its intention to deliver a follow-up to its electric Leaf, Honda showcased a concept car running on hydrogen fuel. The Honda Fuel Cell vehicle (FCV) is scheduled to enter production in 2016 and can reportedly drive some 300 miles on a single tank of hydrogen. As with electric cars, refueling stations and infrastructure remains an issue, and Honda is investing millions into building more stations in California – the only state in which it is currently releasing any FCVs. The long-awaited Acura NSX also made its official debut this year, though concepts of the vehicle have been shown off in previous years. Dubbed a hybrid supercar, the NSX features three electric motors and power distribution that boosts fuel efficiency -- technology which can currently be found only in cars that sell for over $1 million. The NSX will retail for a relatively cheap $150,000. The car was also designed and will be built in the United States. Compared to the others on this list, the Ford F-150 doesn’t seem like it’s much to write home about. It’s a normal looking pickup truck, but Ford ditched steel in favor of an aluminum body and managed to reduce the truck’s weight by 700 pounds compared to its predecessor. Not only does that give the F-150 better fuel economy – 26 miles per gallon on the highway – it also means the truck has more powerful hauling and towing abilities. The aluminum body means the F-150 also handles better and stops quicker. It was handed the 2015 Truck of the Year award. If you don’t like the idea of a gyro sensor deciding how fast you can go round a corner, then this concept car from Toyota is the complete opposite. The idea is that the car ‘intuitively’ understands the rider so that aspects of trust and understanding develop which are “similar to those a rider will have with a horse.” There would be no steering wheel, and the driver would control direction and speed by shifting their body weight while standing. At the moment, the idea remains very much on the drawing board, and many safety issues remain unresolved. However, Toyota insists this could be a reality within 5-10 years. The i-Road looks like a three-wheeled scooter, but is also a two-seat electric city car that can lean into corners like a motorbike. Except unlike a motorbike – where a rider decides how much tilt he’s going to give it – the degree the i-Road tilts depends on the steering angle, a gyro sensor, and the vehicle’s speed. But don’t think you’ll get the speed of a motorbike, either; it’s powered by two tiny 2kW electric motors and the batteries have a modest 30 mile range. But unlike the scooters against which it will be competing, it has features typically found in cars – including heating and a stereo.